Panel: Porcelain, by Winsor Fireform. Winsor uses a closed loop fabrication process. The process circulates all effluents, ensuring that no waste water enters the sewage system. Panel 1: Reclaimed redwood from the Main St Bridge in Sacramento, CA. 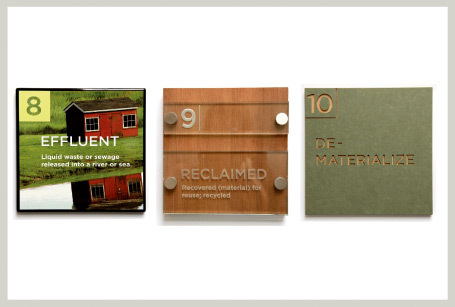 The wood qualifies for LEED Credits Under Materials and Resources; Category - Resource Reuse. Panel 2: Etched glass. Both the wood and glass are recyclable. Panel: Richlight, made from paper. fabric made from recycled soda bottles. The Richlight material comes from trees from certified managed forests in North America. The chemicals used during manufacturing are cross-link during manufacturing process, locked into a solid, homogeneous surface. The type has been mechanically engraved, exposing a light colored inner material layer. Nothing has been applied to surface to create the graphic artwork.